The R.C.L. Br. 374 is hosting it’s first Fall Pancake Breakfast on September 15th, 8am to 1pm. There will be delicious pancakes and sausages topped with sweet local Maple Syrup plus coffee, tea and juice. Conscientious of the environment, biodegradable plates, cups and bags will be again used. The cost is $9.50/adults, $8.50/seniors and $5.00/children 10 and under. Supporting Legion events, supports your local Veterans and their families, as well as many of the local organizations for senior and youth. Whether it be a Saturday drive to enjoy the beautiful scenery, or checking out the Sylvan Circle or any other local activity, you will definitely want to stop by the Legion in Richards Landing for the Fall Pancake Breakfast. 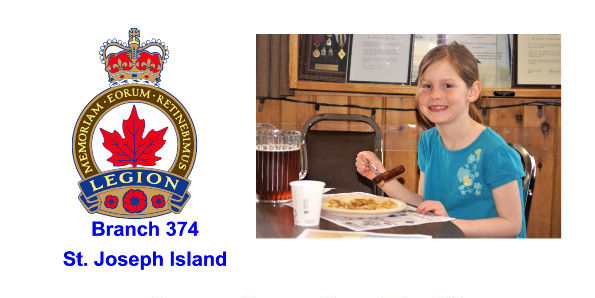 Everyone is welcome at the St. Joseph Island Royal Canadian Legion Branch 374.